The first brand new school has opened under the £45bn Building Schools for the Future scheme, but how is the plan to rebuild or refurbish all England's secondary schools progressing? 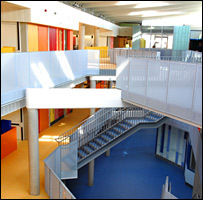 There is a real "wow" factor when you walk through doors of the £24m Bristol Brunel Academy, the school's new principal Armando di Finizio says. "It's incredible really - it's a cross between a shopping mall and Hogwarts because there are all these stairs criss-crossing." The whole school is a wi-fi zone. 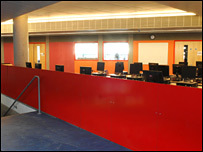 It features independent learning areas and uses biomass boilers to provide about 80% of its energy. It really is a school of the future. "When you first walk in there is this 'wishing wall' which has a whole load of wishes from staff and pupils carved into stones," Mr Di Finizio says. 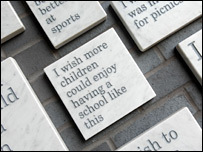 One reads: "I wish more children could enjoy having a school like this." And if the government's Building Schools for the Future scheme to rebuild or refurbish every school in England goes to plan then perhaps one day they will. But with £0.9bn of the £6.3bn ear-marked for the first chunk of school buildings project back in 2004 still unspent, the question has to be when? 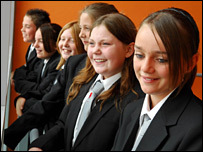 Bristol was one of only a handful of local authorities to sign off its plans and contractual agreements to rebuild five schools in the city on target. And even though announcements have been made about six waves of BSF projects, eight local councils in the first wave of the scheme - whose schools were considered most in need of redevelopment - are still to sign deals with their private sector partners. This does, however, leave 11 deals representing the rebuilding and refurbishment of 150 schools signed under the BSF programme. Tim Byles, chief executive of Partnership for Schools - the body charged by government with helping local councils deliver the project - says there were good reasons for the delays. Many of the local authorities in early BSF projects are the ones facing the most challenging circumstances, he says. He and government ministers agree the original aim to have the earliest BSF deals signed off by December 2006 were unrealistic. "The original targets were from a time of command and control arrangements between central and local government," he said. "We can't force them to do things but what we can do is ensure the procurement process is carried out properly. "And it's worth taking the time to get it right." But Bristol, it appears, has managed to do just that whilst meeting deadlines which it acknowledges were very tight. General manager of Bristol local education partnership John Burgess says despite early setbacks with the firmness of the site's ground and a change in personnel part way through, he never once feared the project would fall apart. "It was a very strong wish from Bristol City Council that we be ready to open in September 2007." "If you've got 1,000 pupils and families lining up behind you - it's a very big commitment." This led the council and its private sector partners, Skanska, to take a leap of faith and start building works two months before the 10-year contract was signed. "In lots of ways, both the public sector and the private sector do have to have tough deadlines to aim for. "There's always the ability for these things to expand to fill the available time," he adds. And there is concern about the BSF delays within central government. A Department for Children, Schools and Families spokesman said the government did not want to be in a position where it was sitting on money which should be benefiting teachers and their pupils. The money that should have been spent between 2004 and 2007 would not be lost to the school system and would be handed over to local authorities once they had their BSF plans approved, he added. According to government plans, by 2011 BSF projects should have begun in every local authority in the country. And Partnership for Schools is insistent that it has taken the necessary steps to ensure further delays do not mar the future transformation of England's schools. These include tightening up the bidding and procurement process and ensuring that the local authorities granted BSF cash are ready to proceed. Back in Bristol the determination and good working relationships appear to have paid off. "Some of the kids, their jaws just dropped in amazement when they walked through the doors," says Mr Burgess. "That's what we are all working for in education at the end of the day - the children." Mr Byles says the opening of this first BSF school was a cause for celebration for the young people, teachers and local community in Bristol who were being given "a fresh start, new opportunities and state-of-the art facilities". "The academy exemplifies what we are trying to achieve through the BSF programme and we are working hard with local authorities and the private sector market so that every child in England has the same opportunity to thrive and reach their full potential," he adds.